Spectre has all the hallmarks of a Bond film: Ridiculous stunts, maniacal villains, and snarky secret agents. The film opens in Mexico City, where James Bond (Daniel Craig) finds the first clue that will lead him to an organization known as SPECTRE. Meanwhile, a threat looms inside MI6 with the creation of a new intelligence program, which would officially eliminate the need for all ‘00’ agents, including Bond himself. The director of Skyfall, Sam Mendes, comes back for this new installment of the franchise. Many of the same cast members have returned as well, including Naomie Harris, Ben Whishaw, and Ralph Fiennes, who made the most of their relatively small roles. One of the things I never tired of as the sharp contrast between Q (Ben Whishaw) and James Bond. Sometimes Bond’s cocky attitude can be overpowering, so Whishaw’s geeky character really balances out Craig’s suave persona. Among the new faces of Spectre were Christoph Waltz, Léa Seydoux, and Andrew Scott, all of which were great additions to the cast. Christoph Waltz was especially fun to watch, playing the classic villain, always scheming and making elaborate metaphors under a shroud of shadows. On anyone else, the act might have seemed melodramatic and outdated, but Waltz was sinister and soft-spoken enough for it to work. That being said, Spectre squandered an incredible cast member by giving Waltz hardly any screen time. The entire movie seemed to be leading up to his character’s reveal, so I felt pretty gypped at how little time was actually allotted for him. As far as spies go, I’m more of a Jason Bourne girl, so I didn’t go into Spectre with extensive knowledge on the 007 series. I could still follow along just fine, but the film does harken back to a few prior installments of the Bond series, namely Skyfall and Casino Royale. I’d definitely advise viewers to watch the previous three Daniel Craig adaptations, if only because certain references within Spectre lose their impact without such background knowledge. It’s also hard to truly appreciate Spectre’s “ambiance”, if you will. The film tries really hard to reproduce the atmosphere of older Bond movies, and it does succeed in that aspect. 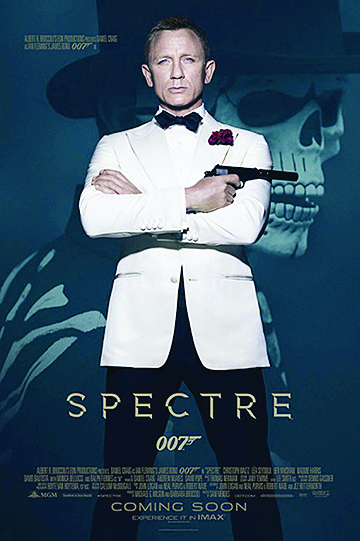 All in all, Spectre is a great action flick, especially for the James Bond fanatics out there.